First moonwalker Neil Armstrong and President Barack Obama get their picture taken on July 20, 2009, during an Oval Office meeting to commemorate the 40th anniversary of the Apollo 11 moon landing. Astronaut Neil Armstrong, the first man to walk on the moon, was remembered by friends, colleagues and admirers as a man who made his country believe anything was possible with ingenuity and dedication. 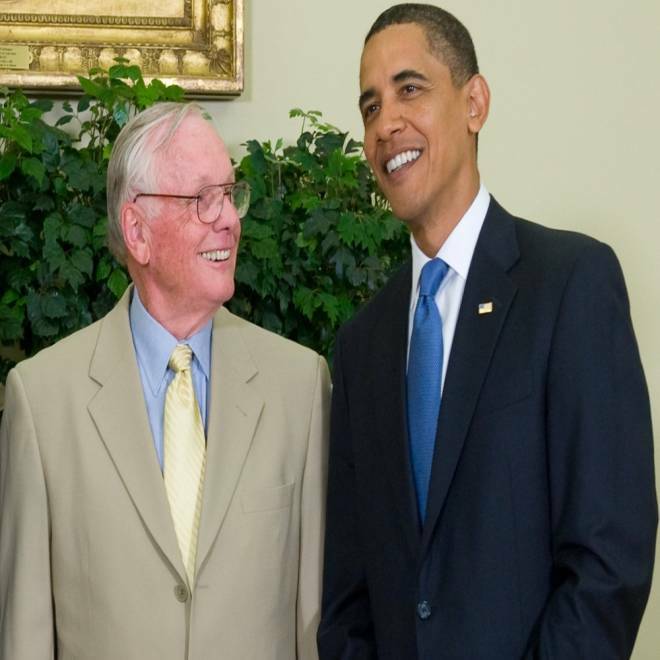 President Barack Obama: "Michelle and I were deeply saddened to hear about the passing of Neil Armstrong." "Neil was among the greatest of American heroes — not just of his time, but of all time. When he and his fellow crew members lifted off aboard Apollo 11 in 1969, they carried with them the aspirations of an entire nation. They set out to show the world that the American spirit can see beyond what seems unimaginable — that with enough drive and ingenuity, anything is possible. And when Neil stepped foot on the surface of the moon for the first time, he delivered a moment of human achievement that will never be forgotten. "Today, Neil's spirit of discovery lives on in all the men and women who have devoted their lives to exploring the unknown — including those who are ensuring that we reach higher and go further in space. That legacy will endure — sparked by a man who taught us the enormous power of one small step." Buzz Aldrin, astronaut who was lunar module pilot on Apollo 11: "I am very saddened to learn of the passing of Neil Armstrong today. Neil and I trained together as technical partners but were also good friends who will always be connected through our participation in the mission of Apollo 11. Whenever I look at the moon it reminds me of the moment over four decades ago when I realized that even though we were farther away from earth than two humans had ever been, we were not alone. "Virtually the entire world took that memorable journey with us. I know I am joined by millions of others in mourning the passing of a true American hero and the best pilot I ever knew. My friend Neil took the small step but giant leap that changed the world and will forever be remembered as a landmark moment in human history. I had truly hoped that in 2019, we would be standing together along with our colleague Mike Collins to commemorate the 50th Anniversary of our moon landing. Regrettably, this is not to be. Neil will most certainly be there with us in spirit. NBC's Jay Barbree, Brian Williams and former NASA astronaut Mark Kelly reflect on the life of Neil Armstrong. Michael Collins, the astronaut who piloted the Apollo 11 command module and circled the moon while Aldrin and Armstrong went to its surface: "He was the best, and I will miss him terribly." John Glenn, former U.S. senator and the first American in orbit, who went through jungle training in Panama with Armstrong: "When I think of Neil, I think of someone who for our country was dedicated enough to dare greatly." Charles Bolden, NASA administrator: "As long as there are history books, Neil Armstrong will be included in them, remembered for taking humankind's first small step on a world beyond our own. Besides being one of America's greatest explorers, Neil carried himself with a grace and humility that was an example to us all. When President Kennedy challenged the nation to send a human to the moon, Neil Armstrong accepted without reservation. As we enter this next era of space exploration, we do so standing on the shoulders of Neil Armstrong. We mourn the passing of a friend, fellow astronaut and true American hero." Mitt Romney, presumptive Republican presidential candidate: "Neil Armstrong today takes his place in the hall of heroes. With courage unmeasured and unbounded love for his country, he walked where man had never walked before. The moon will miss its first son of earth. I met and spoke with Neil Armstrong just a few weeks ago — his passion for space, science and discovery, and his devotion to America will inspire me through my lifetime." Rep. Paul Ryan, R- Wis., presumptive Republican vice presidential candidate: "We lost a great American today. … This is a man who proved that we can imagine big things, who showed that in America you can set very lofty goals and accomplish them. Neil Armstrong is the epitome of American vision, American power, American creativity and how we can set the horizons and achieve our goals." Leon Panetta, secretary of defense: "We are bidding farewell to one of our own. As a decorated Korean War veteran, as an astronaut for NASA, and as the first man to walk on the moon, Neil inspired generations of Americans to believe that as a nation we are capable of achieving greatness that only comes with determination, perseverance, and hard work. As a true pioneer, his one small step showed all mankind the great feats we can accomplish when we set ourselves to the task. While Neil is no longer with us, his spirit and his legacy of American achievement and national pride will live forever." Sen. Bill Nelson, D-Fla., chairman of the Senate Science and Space subcommittee, who flew on the shuttle Columbia in 1986: "Neil Armstrong understood that we should reach beyond the stars. His 'one giant leap for mankind' was taken by a giant of a man." John Boehner, R-Ohio, House speaker: "A true hero has returned to the heavens to which he once flew. 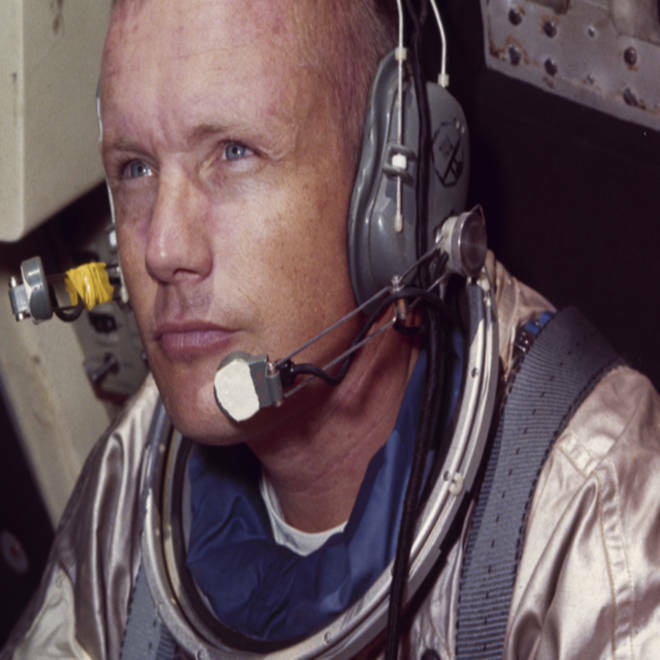 Neil Armstrong blazed trails not just for America, but for all of mankind. He inspired generations of boys and girls worldwide not just through his monumental feat, but with the humility and grace with which he carried himself to the end. Ohio has lost one of her proudest sons. Humanity has gained a legend." Rep. Ralph Hall, R-Texas, chairman of the House Science, Space and Technology Committee: "Neil Armstrong was an inspiration to all Americans, not only for his role in one of the proudest moments in American history, but also for his courage, grace and humility. He exemplified all that is great about mankind, and he will forever be revered as a true American hero." Lon Rains, chairman, Coalition for Space Exploration: “Neil was a humble man who devoted his life and his career to serving a greater cause. From the children who strive to explore the stars to those who devote their lives to reaching beyond the bonds of earth, one can only hope to follow in his footsteps."